Baugsmálið: Af hverju klúðraði Baugur Arcadia samningnum? Af hverju klúðraði Baugur Arcadia samningnum? Fact was stranger than fiction as the BHS boss plotted the takeover of Arcadia. Report by Rory Godson. TEN days ago, Philip Green phoned his mate Stuart Rose, chief executive of Arcadia, the fashion retailer. The billionaire BHS owner said the phoney war was over and he had written to Rose offering to buy his company for cash. He wanted to read out the letter. Then he burst into a rich tenor voice, singing “If I were a rich man,” the signature tune of Fiddler on the Roof, the musical about poor, oppressed Jews in tsarist Russia. The deal on offer would earn Rose Pounds 25m. Green, 50, is neither poor nor oppressed. He divides his time between a home in Monaco and a suite at one of London’s best hotels. He sprang to prominence in January when The Sunday Times revealed that he had turned a Pounds 200m investment in BHS into a Pounds 1billion business in 20 months. Previously a mere multi-millionaire, Green was now a billionaire. At the same time that Green came so publicly into a vast fortune, Jon Johannesson, a colourful Icelandic businessman, was in London looking for money. He is chairman and 30% owner of Baugur, one of the largest firms on the tiny Reykjavik stock exchange. Baugur had built up a 20% interest in Arcadia which has enjoyed a spectacular improvement in its fortunes since Rose was appointed chief executive. Now it wanted to buy Arcadia and split up its various brands. Johannesson’s company is worth about Pounds 200m. He is 34 and comes from a country few people have visited. He has shoulder-length hair and a goatee beard, dresses in black and stays at the impossibly trendy Sanderson hotel. For all these reasons, it is not surprising he could not persuade banks to finance the Pounds 700m takeover. The deal might have died but Green and Johannesson separately coveted Arcadia’s retail chains. Green wanted its mid-market brands – Burton, Dorothy Perkins and Wallis. The Icelander wanted its youth outlets, Miss Selfridge, Top Shop, Top Man and Evans. Through the spring, Baugur continued to rummage through the banks of London. Green, meanwhile, invited Rose to his 50th birthday party in Cyprus where Tom Jones sang to the toga-clad crowd. Green let it be known to Rose that he wanted Arcadia if a deal could be done. There was, however, another game in town. BHS and Arcadia had been turned round but Woolworths was poorly. It had gone from bad under Kingfisher, the retail giant, to worse as a demerged entity. In June, Green, advised by Bob Wigley, of Merrill Lynch, made a bid to merge BHS with Woolworths. He was rejected by Gerald Corbett, the chairman. Green told Wigley he had another target – Arcadia. There was a flurry of excitement in early August when Green flew to London for a meeting with his advisers. It was wrongly assumed he was looking at Woolworths. In 72 hours, he met Johannesson, sketched out a deal to split up Arcadia and got a written commitment from HBOS to finance the purchase. He would sell the youth brands to Baugur for about Pounds 250m in return for its support for a bid. Green told Rose that he might offer 365p a share. The Arcadia boss rejected the “bid” and chose not to disclose the offer. The news was broken in The Sunday Times. Arcadia stock soared and shareholders made it clear Green would need to up the ante. Green, Baugur and their bankers spent a hectic week finalising the terms of a new offer. On Wednesday August 28, Green noticed Johannesson seemed agitated and darted from the BHS conference room to make calls to head office. He insisted nothing was amiss. That evening, Green phoned Rose to say the offer was “in the post”. When Rose opened the envelope, he was impressed. At 408p, Green was offering a premium of 50% over the price before his first approach. Rose issued a statement saying the board would meet to consider the bid. At 2.30pm, Green got a call from a reporter. “She told me: ‘your punter’s been nicked’,” he says. 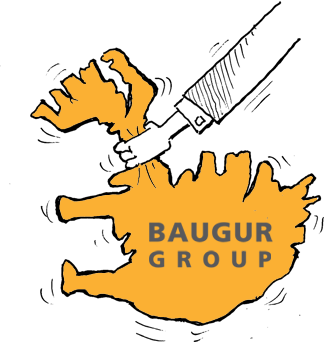 Reuters had reported that the Icelandic fraud squad had raided Baugur head office. Green knew the sins of Baugur, real or imagined, reflected on him. His reputation was on the line. At about 8pm, Green, Wigley and other advisers had an emergency session at the canteen at BHS in Oxford Street. The scene was surreal: the restaurant was closed and half-lit. The chairs were piled on the tables. Then he whipped out a cheque book: “Let’s end the misery now. I will buy your shares.” The meeting adjourned and the shaken Icelanders were invited to reconvene in Green’s hotel suite. Not surprisingly, they brought their lawyer. The papers arrived at 1.30am. Green showed them headline after headline about the raid and the implications for the deal. Chastened, they crept away at 3.30am, promising that Johannesson would return. Four hours later, Arcadia issued a statement saying that its board would not examine any deal conditional on a sale of some stores to the Icelanders. This presented a huge problem for Green. Because Baugur was a substantial shareholder, any deal involving asset disposals to it would have to be put to the other Arcadia investors. They would decide whether Baugur was receiving preferential treatment. But Baugur would not pledge its stock to Green unless he promised to sell shops to them. Later that day, Johannesson met the still angry Green who repeated his determination to buy out the Icelandic company. As his yacht was moored off Cannes last weekend, Green hatched a new plan. He would set up two companies for the takeover and offer Baugur an option to buy one company that would include all the brands it wanted. He told Baugur and Merrill Lynch of the plan and the lawyers had already started drafting agreements when Green returned to London on Monday. In the early hours of Wednesday, Green snapped with a Baugur adviser. Damian Thornton, a senior executive at Deutsche Bank claimed that the BHS boss was being unreasonable. On Wednesday Green decided that it was impossible to do a deal with the Icelanders which protected his interests and did not favour them over others. He issued an ultimatum. They could sell their shares or he would walk. Late in the afternoon, they agreed to pledge their stock to his deal. They got no promises they will get any of the stores he may sell in future. If I were a rich man, Ya ha deedle deedle, bubba bubba deedle deedle dum.